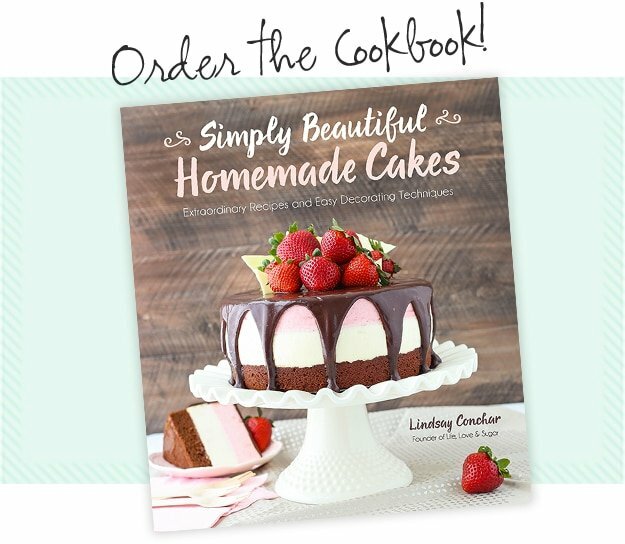 Today’s recipe takes one super easy cake and shows you how to mix it up into five different flavors! Each is delicious and super moist. 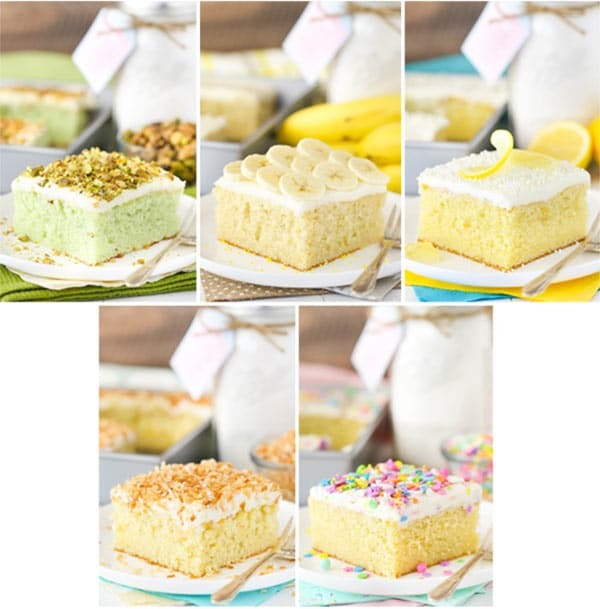 Pistachio, banana, lemon, coconut and vanilla – take your pick! So you may remember the Homemade Vanilla Cake Mix I shared with you a few weeks ago. Well, I expanded upon that today and added pudding mix to the batter! Like most cake mixes you buy at the store that come with “pudding in the mix!”, I decided to add some pudding to the mix. It not only adds moisture to the cake that lasts for days, it adds some fun and different flavors without having to change your recipe. I’m loving it! I’ve also included a couple different frosting options that are easy to adjust to the cake flavor you choose. One is a more standard buttercream and the other is a cream cheese frosting. 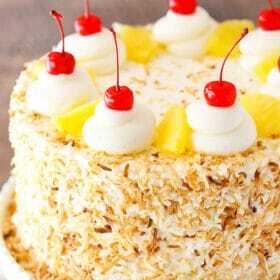 So to start, we’ve got our standard vanilla cake. You could certainly leave out the pudding mix, but it totally amplifies the vanilla flavor and adds moisture that lasts and lasts. I paired it with a vanilla buttercream, but you could change it up for the cream cheese frosting – or add some flavored extract. Next up is the coconut. Again, so much amped up flavor and moisture. 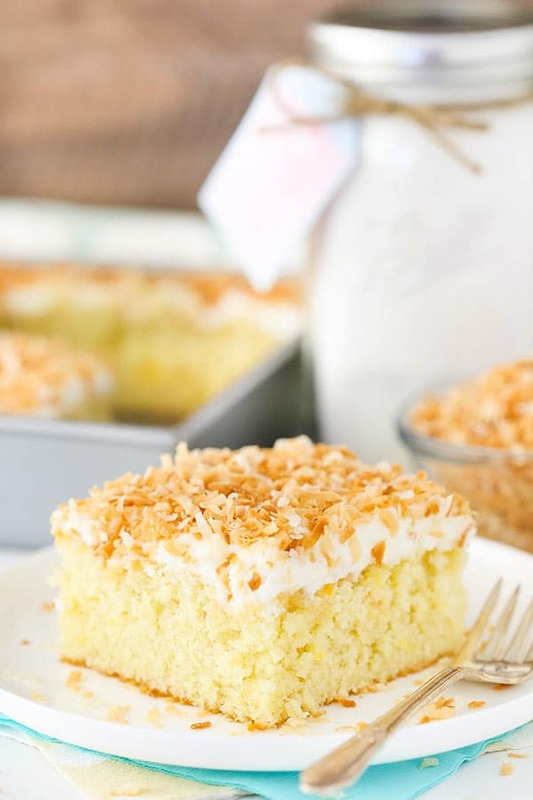 And with a coconut frosting – summer in a cake pan! I also tried one of the new JELLO “Simply Good” pudding mixes in the banana flavor. 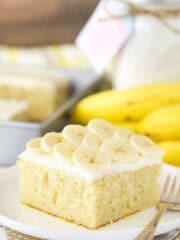 I considered using the regular banana pudding flavored mix, which would totally work too, but I loved the idea of a more natural banana flavor. It was perfect in this cake! And when paired with the cream cheese frosting – it’s the jam! Another delicious option is the pistachio pudding. 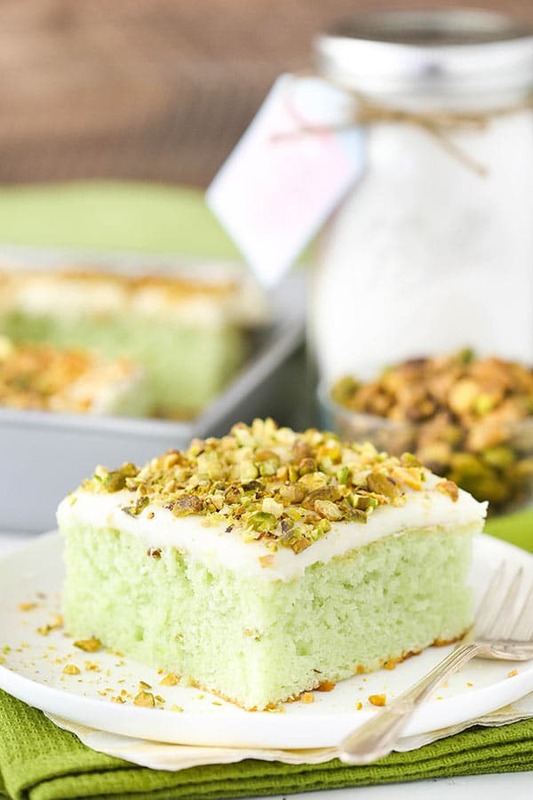 Such a great way to give a cake some pistachio flavor! I topped it with some cream cheese frosting with a little honey mixed in and some chopped up pistachios. I’d be lying if I said I’m not slightly in love with pistachios these days, and this cake just made them even better! And last, but not least – lemon! Citrus can be tricky when baked into a cake, so this is a great, easy way to make a moist and easy lemon cake. 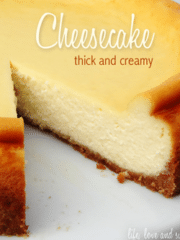 It’s perfect with a cream cheese frosting – yum! 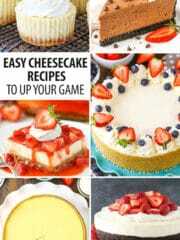 All five cake options are delicious and super easy to make! 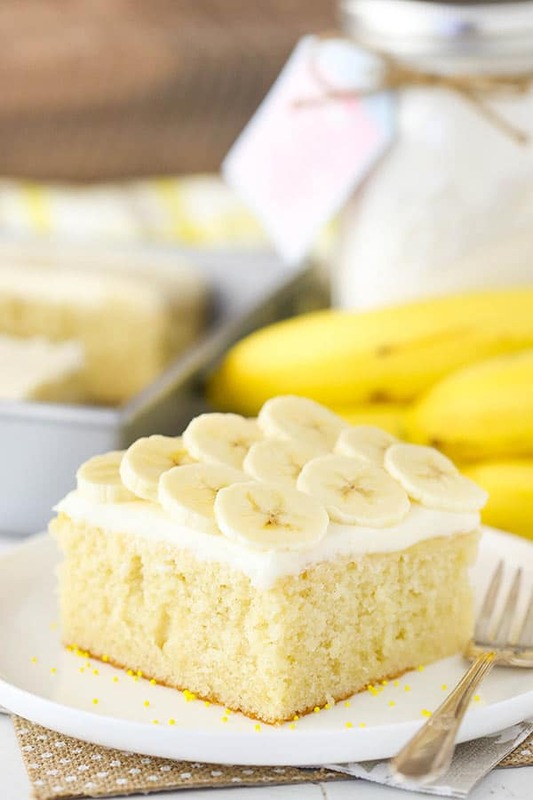 It’s such a great way to mix up a cake flavor without a lot of fuss. Plus, the cakes are super moist! I hope you have fun switching it up! One cake recipe that is switched up with different pudding mixes and frosting options. Try out your favorite pudding flavor and choose from a buttercream frosting or cream cheese frosting. 1. Preheat oven to 350°F (176°C) and grease a 9×13 inch cake pan. 2. Combine the flour, sugar, baking powder, salt and pudding mix in a large mixer bowl. 5. Add the wet ingredients to the dry ingredients and mix until well combined. 6. Slowly add the hot water to the batter and mix on low speed until well combined. Scrape down the sides of the bowl as needed to make sure everything is well combined. 7. Pour the batter into the greased cake pan and bake for 35-40 minutes or until a toothpick comes out with a few moist crumbs. 1. Combine the butter and shortening in a large mixer bowl and mix until smooth. 2. Add about half of the powdered sugar and mix until smooth. 3. 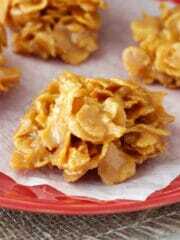 Add the flavor extract of your choosing (vanilla, coconut, etc) and the water or milk and mix until smooth. 4. Add the remaining powdered sugar and mix until smooth. 5. Spread the frosting onto the cooled cake. 1. Combine the cream cheese and butter in a large mixer bowl and mix until smooth. 3. Add the water or milk and mix until smooth. * Feel free to use the pudding mix of your choice. I used Jello brand and found vanilla, coconut cream, banana, pistachio and lemon to work the best. 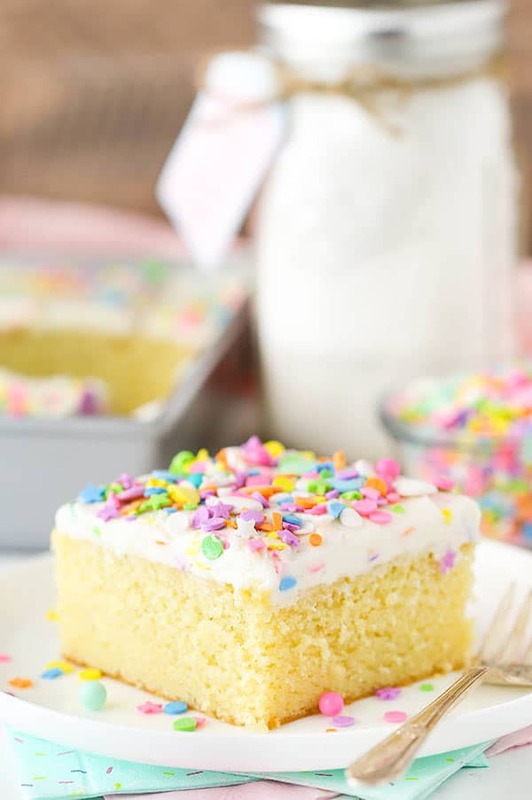 ** The milk or water can be replace with another flavoring, such as honey, lemon juice or something else to add additional flavor to the frosting. Love all of these options! Wish there was an orange pudding or do you have a solution for that? I’ve never seen an orange pudding mix. I’ve seen orange jello – is that what you mean? 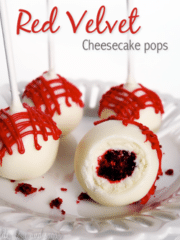 I did try this with Jello and didn’t care for it as much, but you could certainly try it. The cake baked fine. Oh, I know, I have never seen orange pudding, either. Wishing there was! I was just wondering if you had any other suggestions (or recipes) for adding orange to a cake recipe. I made a cake with Jello back when I was in junior high. We made it for Home Ec for a fundraiser. It was a poke cake. We baked the cake mix then poked out holes and poured jello into the holes. Love all your recipes,and always look forward to the emails. Thanks for the great recipes. I love using pudding mix for baking! It adds a lot of moisture. I love that this cake can be so many things! 😀 I was wondering if you could try a pudding mix for cookies? 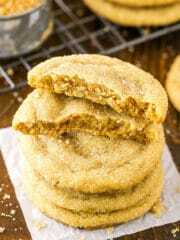 I have a friend, (and I’ve seen a lot of recipes) where people add a vanilla pudding mix to their dry ingredients when they make chocolate chip cookies, and their cookies are always adored. Can this recipe be made in a round spring form pan? Or does it need to be in a sheet pan for the texture cake to hold together? It’s a very thin batter, so you’d want to be sure it’s a very leak-proof springform pan. Plus, it’s going to be a little too much batter for a 9 inch, if that’s what it is. You’d need two pans for two layers. Great idea, Lindsay! Tried the the vanilla and it was not only super easy but made twelve delicious cupcakes in no time. 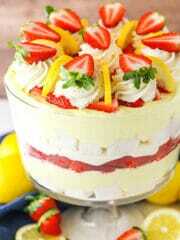 Jello has Simply Good Puddings in Choco Late and Strawberry, too, and I wondered if you’ve tried either of those? Both sound wonderful, don’t they? 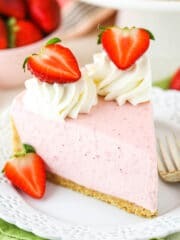 I’m thinking of adding some chopped fresh strawberries to the berry one and substituting a bit of cocoa for part of the flour to ramp up the flavors of the chocolate. Nope, you’re right, it was strawberry jello. In our store, they have the Simply jello and pudding all mixed together. Sorry! No need to be sorry. I made the same mistake at first too. 🙂 They look very similar. I’m sorry, but I don’t know of an alternative for flavoring the cakes another way. It would still bake fine as a vanilla cake though without the pudding mix. 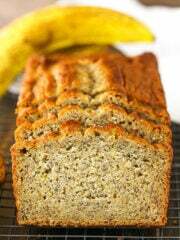 So easy, so moist, so wonderful! 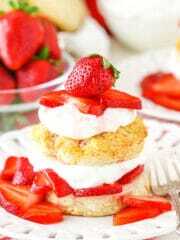 So versatile depending on your pudding choice, endless possibilities! I went Butterscotch pudding, Cream Cheese frosting with a caramel flavor. We all sat back in silence as we ate our cake, not saying a word, just in total bliss. I’m so glad you all enjoyed it! Thanks Marc! 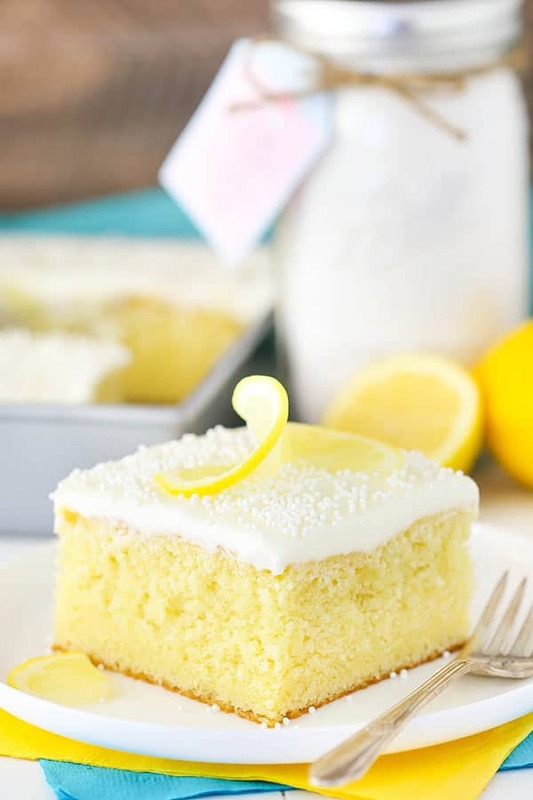 Can the lemon cake be made into 3 8″ round cakes rather than the sheet pan? That should be fine. I’d suggest a bake time of around 24-28 minutes. My 11 year old daughter made this cake 100% on her own and it’s the best vanilla cake we have ever had! We added peanut butter icing and it’s delicious! How would you recommend flavoring the frosting to make it chocolate buttercream? Thanks! Here’s a chocolate version that you could use. 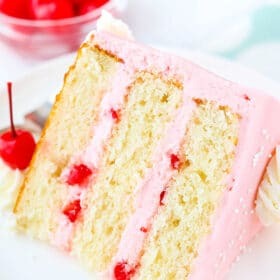 Hi I bake this cake today and the cake did not rise at all it was a total flop and I baked it on the time that you said 35 to 40 minutes and the cake was dark on the outside and not done in the middle my oven was on 350 I also want to know if you can use baking soda as well and can I switch out the milk for buttermilk. Without see it it’s hard to say what the problem was. The recipe requires baking powder. I haven’t tried buttermilk, but you could certainly try it. I haven’t tried it before. You could try swapping out the milk for a dairy free one. I assume the pudding mix might have dairy in it too, so you could leave that out and just make vanilla. The first time I made this I accidently put hot water in with wet ingredients, it was suuuuper dense, but still tasted good, second time I didn’t let it cool long enough and it cracked all over…now I’m trying again and forgot the dang vanilla extract…hoping the pudding will bring it through enough…the main thing I have with the cake is the chocolate chip cookie dough frosting in middle and cake is kinda just ts vehicle…hopefully its OK..but this is a wonderful recipe!